So you wouldn't for example, think to highlight 3 or 4 weekends/Sundays in advance at Grafham to boost the local fleet race and maybe offer some cross-over / wrap-around training? £20 a weekend into the tin.... Naturally with a Thursday night green or red flag on the facebook group / email list depending on the forecast??? It's a rhetorical question of course, and by no means meant as a criticism. My point is that consolidation into the SJ series is the default option now for a lot of class winter programmes, but there are and always were other options that might be worth re-visiting at your (or any other) class committee meetings. If the Grafham D-Zero fleet or another club decided to run something then the CA would help them to promote it. Well it’s certainly true that when I was doing my bit for northern uni sailing, I actively pushed for our regional BUSA qualifier events to held on salt water or larger lake venues - the amount of lost time to no wind, ice breakers at the smaller ponds wasn’t something I wanted to repeat. Fine for the uni opens... and not a problem to lose an hour or two in the morning over bacon, but for time sensitive events we just wanted to get the job done. We were lucky in that my uni sailed at South Shields who were sh*t hot at supporting us, plus Newcastle Uni sailed out of tynemouth SC- again a great club, and despite obvious rivalry,Newcastle Uni could keep their sh*t together and run a decent day’s sailing. Sea clubs have extended their season to the detriment of the winter pond sailing. Seems daft because on the shoulders of the season the races are often cancelled where as you could have sailed on the pond. Not daft at all. The sea is warmer in winter than the lake. And in some parts (N Scotland) the sea can be the only option, given the amount of icing inland during the winter. There is nothing wrong ... with agreeing to differ on this one ! You are not convinved about the SJ and similar events growth in recent seasons and what it indicates or the significance of it.... Your conclusions are possibly because you, as an individual, simply don't like to attend/compete in them currently. Nothing wrong with that. Some of us might however think you and others are missing out. The world of dinghy racing has always been changing - little can be assumed as being forever whether it is classes, technology or event organisation. It is now, in part, about adapting or embracing these changes positively and growing with the 'new'. And there is nothing wrong with that either ! Having done a few years travelling in a class where the main bulk of boats were the opposite end of the country (most events required at least a 200 mile round trip) I found that it got old very quickly. Especially for us few in the mid fleet who were a performance gap behind them at the front. The Class Opens we attended seemed to attract mainly the top 10 or so sailors in the class, then one maybe two mid fleet and if lucky one lower fleet/newby. We found that we were sailing around by our selves quite allot hanging on to the coat tails of those in front for a lap or two but being a distance off those behind. In the end it didn't seem to be worth the effort as we werent getting any decent racing. Changed class and mainly club race now with the odd excursion to local opens. Its the mid fleet which seems to have collapsed. Not enough carrot maybe. What evidence is there that winter handicap sailing is growing? Years ago, my mates and I used to go on winter memberships to a local gravel pit club - this was always PY based, but I can't really remember caring for the results to much outside of whatever class I/we happened to be sailing at the time. The local membership always made us very welcome, and of course, reciprocity was on order for a couple of the larger sailing weeks in the summer on the coast. I don't think this model for sea clubs and inland co-existence was that abnormal was it? I'd say a good 50% of the racing membership of our club de-camped to the pond, or sought training through class associations (adults) and the better kids in youth squads etc. Does this still happen now? Or have sea clubs extended their seasons? Do more sea club kids get into squads, thus don't do that much local winter handicap sailing? Portland always seems thronging with activity whenever I've been down there for windsurfing. (I only tend to go in winter months btw). And that's youth and junior class race training, not handicap sailing. There's a hell of lot more than 10 or so guys and 10 or so girls down there like the youth squads of the 80's and 90's. 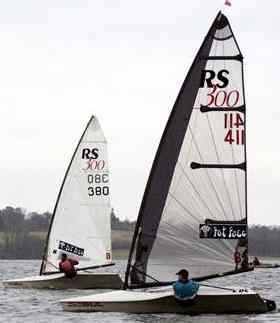 There's enough colloquial evidence that the RYA plunder the youth of local club racing the rest of year, I'd bet a pound to a penny the same accusations stand up for winter sailing. I think you need to be very careful simply comparing the entry stats from say a Bloody Mary pre-amalgamation and post to come to the conclusion winter handicap sailing is GROWING Mike. These stats might work in isolation to showcase the event in more positive lights itself, but I wouldn't draw conclusions that it represents a major shift change in OVERALL participation and reversing OVERALL decline - quite the contrary, it shows that this is all that's really left for many adult racers looking to get away at the weekend in winter- in other words, consolidation. I'm not concerning myself with positives or negatives, neither am I trying to personalise it in any way. I am simply suggesting that rather than looking to run (or share with similar craft) a winter programme consisting of winter championships, winter opens, icicle races, winter training days and all the other myriad of names for meeting up that have come and gone over the years; a lot of classes are defaulting to the SJ series under the auspices of PY for their winter programme - this is consolidation whichever way you cut it. I'll leave it to others to draw their own conclusions if this is positive or not for competitive sailing, or at the very least, the classes they sail. Personally my favourite winter 'events' were class organised training days in several one designs I've owned - I always got far more enjoyment out of them than travelling to a.n.other pond to do a handicap race, but each to their own. But of course if you are now becomming convinced that the SJ series can play a useful role to all vibrant and practive classes then why on earth not do a few yourself this winter ?